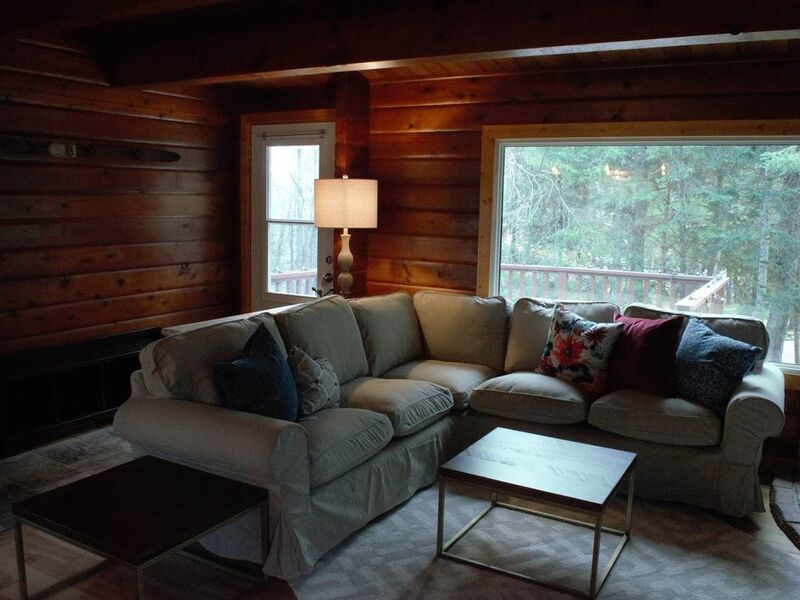 This beautiful cedar log panabode offers a completely renovated space for your family to enjoy all that Huntsville and the surrounding area has to offer. The main floor offers an open floor plan with a gorgeous kitchen that has expansive windows overlooking the wooded yard. The dining area comfortably seats six and the living room is equipped with a gas fireplace for those cozy log cabin nights. Down the hall you will find a fully updated 3 piece bath, master bedroom with queen bed, and second bedroom with double and the best view in the house. A gorgeous picture window that overlooks the forested valley behind the home. Downstairs you will find a second living room, another 3 piece bath and the third bedroom with a queen bed. There is also a laundry room with high efficiency washer and dryer. The foyer on the lower level has ample space for all of your ski gear and in floor heating to get things dry and warm for the next day's adventures. You are walking distance to Hidden Valley ski hill where you can hit the slopes for the day. Just a few minutes away is world famous Deerhurst Resort which offers everything from spa services to world class golf. Guests can also enjoy the beach access down the street at the Private Hidden Valley Association beach on beautiful Peninsula lake. There is an amazing sandy beach, playground, bbq, and green space for all your summer fun. Downtown Huntsville is a short 10 minute drive away where you can visit historic downtown and browse the wonderful shops or checkout one of the many great pubs and restaurants. World famous Algonquin Park is a 20 minute drive away where you can explore all that nature has to offer. Even closer is Arrowhead park with networks of trails for hiking and exploring and in the winter the skating ice trail that meanders through the woods! Amazing location in a quiet setting and yet still close to everything this beautiful log home is ready for your next escape! My wife and I are Huntsville residents and absolutely love our home in Hidden Valley. We live above our business in town now and just didn't have the heart to sell this beautiful home. So we decided to share it with you! We always loved the neighborhood of Hidden Valley. When we found this cedar log panabode home we knew it had to be ours. It rests on a quiet street with a beautiful wooded ravine behind the home. We love how close it is still to town and all of the other surrounding amenities and yet when your in for the night you feel like you are tucked away in the middle of the woods. Great spot, chalet and decor! Will return for sure ..owners were easy to be in touch with and replied promptly. Great place, plan to come back. A charming and cozy cottage, very close to Huntsville! My family and I had a wonderful time at the Hidden Valley Chalet. The cottage is perfectly situated, a short 8 to 10 min drive to Huntsville and 30 min away from the west gate of the Algonquin park. The chalet contains all the amenities required- the kitchen is quite modern and the living room very comfortable and cozy. The bedrooms are quite sizable and the beds extremely comfortable. The 2 mainfloor bedrooms also offer a beautiful view on the forest. The outdoor temperatures were quite cold for that time of the year, but we always enjoyed coming back to the comfort of the chalet, where we were able to heat to a comfortable temperature as well as use the very nice gaz fireplace for extra warmth. The owners were very accommodating and responded to all our questions in a timely manner. Overall, we loved our stay at the Hidden Valley Chalet and would love to come back another time! Absolutely beautiful! Had an amazing time! Beautiful cabin. Enjoyed our stay at the Chalet. Will be back again!